@Momma Git u off faacebuk and gimme choklat! @Dora – How u fit so much stuf in u bak pak? Choklat is gud! I like choklat! Yummeee! Gimme! Choklat! I wan a try mommie speshial juicie in da fundy cup! Yes, I not do like broklie! @Dadda I wan hot dog mac cheee! It ma fame-it! So cute! The diva will say “welll, ok” and that pretty much means “no way in hell!” They are too funny! Lots of chocolate requests in this house, too! It was a major source of tension for a while!! These are soo cute and hilarious!!! 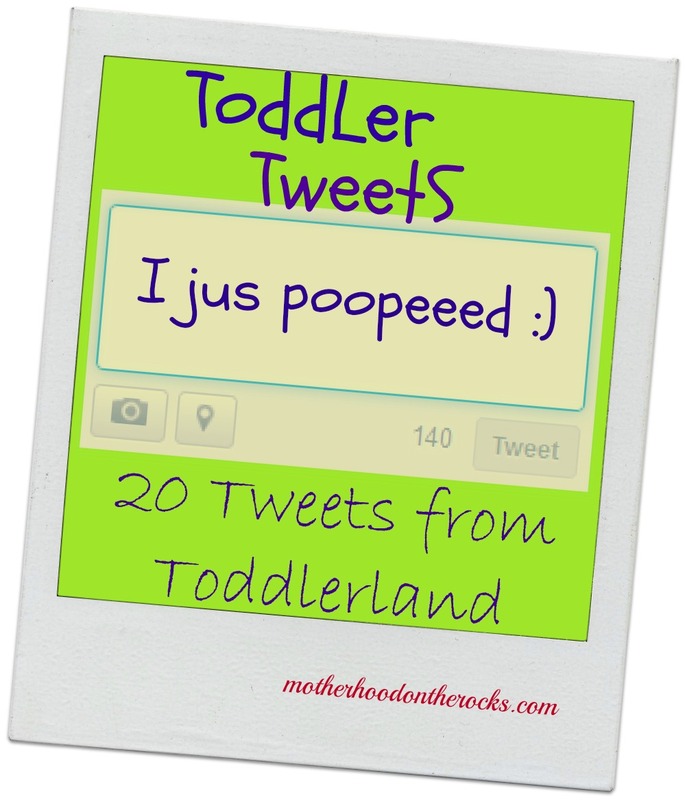 Dead on what my preschoolers and toddlers would be tweetin! Love it! Ha! Oh my this totally made my morning!! So darn cute…and clever! I think if i understood Twitter more, this would be a lot more funny. But it is still really cute. My daughter would probably say something like. ” I love muhmaids. I wanna be a muhmaid when I gwo up. Can I do that momma? awwwww!!! I miss when the diva would say “yook”! Thanks for the laugh! I love these. 12 is my favorite. Sometimes I wish I can go to timeout. Me too, sister! Me too! Hahaha. Gotta love kids, eh? Thank goodness the little one can’t tweet. I hear most of these all day in real life! These are great. Love them. So funny!! My youngest had a onsie that said “Gimme Chocolate and NO ONE Gets Hurt!” He’s also a chocolate lover! The diva NEEDS that shirt!!! Fame-it. I love that. It might become my new fame-it word!! lol! I don’t know how she changed favorite to fame-it, but that’s our new word around here and I love it! That is too cute! 🙂 Thanks for sharing! This is so cute and such a fun idea for a post! Love it and thanks for such a great smile today–you’ve got a cutie on your hands! Thanks for all the great comments! Reading them makes my day!